Cleric Alignment: Lawful Good, Neutral Good, Chaotic Good, True Neutral. Known to her faithful as the Dawnflower, the Healing Flame, and the Everlight, Sarenrae (pronounced SAER-en-ray) teaches temperance and patience in all things. Compassion and peace are her greatest virtues, and if enemies of the faith can be redeemed, they should be. Yet there are those who have no interest in redemption, who glory in slaughter and death. From the remorseless evil of the undead and fiends to the cruelties born in the hearts of mortals, Sarenrae's doctrines preach swift justice delivered by the scimitar's edge. To this end, she expects her faithful to be skilled at swordplay, both as a form of martial art promoting centering of mind and body, and so that when they do enter battle, their foes do not suffer any longer than necessary. Sarenrae is known to be among the early gods that battled Rovagug in defending creation. During this magnificent war of prehistory, the Dawnflower cast down Rovagug to the center of the world. It is believed that after Asmodeus bound the Rough Beast there, Sarenrae placed therein the raging flames of the sun as an eternal torment. Sarenrae counts all non-evil gods as companions, and even communicates with evil deities in the hopes of converting them from their dark ways. She has some distrust for Asmodeus due to arguing over the souls of the dead. Her only true enemy is Rovagug. 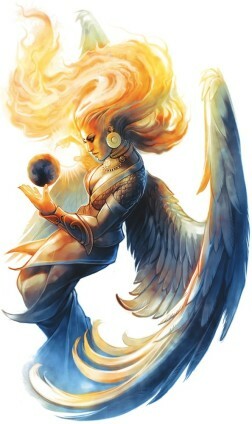 Sarenrae manifests as a bronze angelic beauty, with golden hair composed of flowing flame. From one hand emits a holy light which trickles down like liquid luminescence, whereas the other holds a scimitar emblazoned with radiant fire. 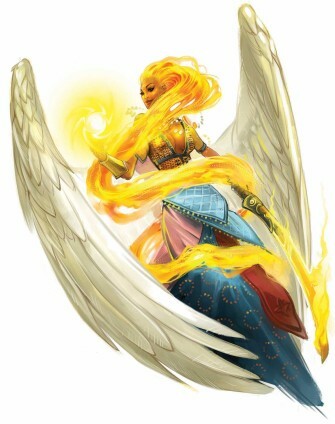 Her holy light provides healing and sustenance, while the scimitar creates gusts of winds that remove disease and fear. Sarenrae has numerous angelic servants. 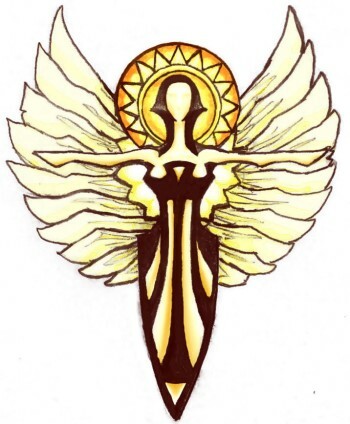 Her herald, the Holy Sunlord Thalachos, is a platinum-skinned angelic minion that is escorted by 11 divine doves. The church of Sarenrae is mostly composed of altruistic priests who are also ready to be stern should it be warranted. The church is known for blessing crops, healing the sick, and reforming criminals and evil doers. They are often consulted to solve feuds and disputes among neighbors and family. The Sarathi Nation holds her as their patron deity and is responsible for spreading her faith throughout Alhara. A large portion of Sarenrae's priests are composed of clerics, but within their ranks are also paladins and rangers, as well as a few druids and bards. Some priests work as personal retainers or healers for the wealthy, while others survive on assistance from congregational worshipers. A common form of worship by priests is to awaken with the dawn and give thanks and praise to the rising sun. The scimitar is a favored weapon and its use is held in high regard. In battle, Sarenrae's clerics become dervishes, ready to destroy irredeemable corruption. The temples of the Dawnflower are open-air buildings. Priests often travel from one temple to the next. The Everlight Oasis in Sarath is a popular site of pilgrimage for followers of the goddess. Church services are held outdoors and are joyous affairs that feature singing, dancing, and music.